Continue the chain of Jewish women throughout Jewish history by baking challah. and the art of shaping and braiding. 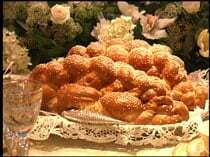 Begin a chain of acts of goodness and kindness by giving your homemade challah to a friend or to a total stranger.